Happy New Year! Please pass the butter. Yes indeed. Many of you have heard me say this many times, but it’s worth saying again because I always love talking about butter, and also because I feel very strongly about this: If you change nothing else about the way you cook and eat, simply change out bad fats for good fats. I mean, I am going to continue to encourage you to stop eating so many cookies, but at the very least, bake your cookies using real butter instead of margarine. Make your pie crusts using palm shortening instead of Crisco. Use olive oil instead of vegetable oil when you make salad dressing. And stir coconut oil into muffins instead of canola. These changes require pretty much no effort on your part, will only slightly effect your budget, and will absolutely change the flavor of your recipes for the better. Healthy fats: the easiest healthy change…ever! But wait, don’t we want to avoid eating too much fat?? Even though I believe many people are beginning to grasp the concept that eating fat is not altogether bad, I still can’t get over how often I hear someone talk about how fattening or naughty something is if it is full of butter or cream cheese. Au contraire. Butter is golden (literally) and offers many wonderful health qualities – because it is a full fat! The same is true for coconut oil and other healthy fats I’ve listed below. Our culture has us brainwashed, but don’t think I’m faulting anyone. I was among those that stayed far away from fat (especially butter!) until just a few years ago. I read every label to check “how many grams of fat” were in each serving. If it had more than just a gram or two of fat, I stayed far, far away (and instead snacked on fat free stuff like Twizzlers – sheesh). After all, eating fat would make me fat, right? Is this because of my metabolism or my body type? No, I don’t believe it is. Eating good fat can help everyone maintain a healthy weight. On the other hand, when I consume too much sugar or just plain overeat? That’s when my jeans get tight and I feel like junk. But that’s another real food reality post for another day. Why don’t healthy fats make us fat? Real food fats are absolutely pure and whole. When we eat them, our insides are like, “Yes! I know what this is. I know what to do with this!” Our bodies can easily digest real fats. Out bodies can utilize every last bit of what is in them. Healthy fats nourish us. So are you saying that I should eat a bowlful of coconut oil every morning for breakfast? Yeah, um no. We don’t want to over eat fats any more than we want to over eat any food. I’m simply saying that we should not be afraid of healthy fats, and we should eat them without reservation to fuel our body’s needs. Foods like cream, cheese, meat, coconut oil, and eggs are naturally full of fat. On purpose. Our bodies need the nutrients they each provide. On the other hand, most vegetables, fruits, and grains are completely fat free. On purpose. They also provide our bodies with needed nutrients. Isn’t it cool how all natural food comes to us in a perfect way to fulfill a purpose within us? When we eat a lovely balance of all varieties of food, we can then fuel our bodies in the way that will keep us going strong! Let’s hear it for a healthy, well balanced diet of real food! Each of the animal fats listed above are most beneficial if from a grass fed or free range animal. But don’t sweat it if that’s not happening for you yet. Just focus on eating real food and do the best you can. Don’t forget that God is bigger than any of your worries. Whew! That’s a lot of information. We’ll talk more about nourishment tomorrow. For today, share with us: How are you coming with switching to healthy fats? What are your favorite sources for healthy fats? Well, like you, my cookies do taste 100% better with butter. I can’t believe it took me so long to make the switch from margarine. I am head over hills for my newfound love, Spectrum brand organic Shortening; it makes delicious biscuits and is more solid than tropical traditions palm oil. I have to say I was not thrilled to pay shipping every time I needed to purchase shortening from Tropical Traditions, so I like that I can get my shortening locally, at Sprout’s. And regarding olive oil, you can supposedly tell if your EVOO is the real deal and not an imposter by putting the oil in the freezer. If your olive oil freezes, and takes on the appearance of butter, it’s the real deal, not mixed with other lower quality oils, like veggie or canola as some companies do to deceive us consumers. I love when our chocolate baked goods take on coconut flavor from Virgin Coconut oil. Thanks, Laura for helping me to learn more about healthy fats. I read that the olive oil test is not accurate. I was shocked to learn that not all olive oil is pure though. Fats in my home cooking are one of the only areas where I’ve got my real-food-act together! Love butter and coconut oil! My biggest problem is getting rid of the pre-made junk and adding in fruits and veggies. BTW Laura, speaking of real food, I made your raspberry oat bars, you know, the ones with ONE CUP OF HEALTHY BUTTER FAT! So delicious, I think we’ll rename them BUTTER BARS because the butter flavor was so prevalent! We thoroughly enjoyed them and plan to make another batch soon to use up our homemade raspberry jam. Thanks for the recipe. Amen, sister! I gained not one single pound when switching over to real fat. The worst of my pms symptoms disappeared, too. Not nearly so moody, depressed, crampy. Coincidence? I think not. Also gave processed foods the boot. Now if I could just get back on the exercise wagon…. Actually, I’ve read that omega 3’s and fat greatly affect our mood (depression). According to my reading, some people with clinical depression are eating highly processed diets. Instead of taking medication, some patients were asked to change their diet to one that was non-processed, high in omega 3’3 and rich in good fats. The diet actually changed their mood without the need for medication. Most highly processed food contains too many Poly-6’s from things like soybean oil (often labeled as vegetable), hydrogenated oils, etc. Honestly just getting rid of highly processed food and switching to, grass fed butter, olive oil, coconut oil and sustainable palm shortening instead of soybean/vegetable oil, Cisco etc. will do wonders. My good Cholesterol is through the roof. I believe it. All the chemicals in processed foods can’t be good for anybody either, even without the fat consideration. There is an interesting documentary called Fat Head (kind of funny and irreverant, but informative) that discusses the link between fat and mood too. I figure real food = MUCH better than processed food, period. Have you researched lard at all? I was wondering how that stands as a healthy fat? Not the hydrogenated kind you find on shelves, but plain old lard. My understanding was that it was in the same vein as butter nutritionally speaking. I would love your opinion., sorry if this has been answered elsewhere, but I couldn’t find anything. Oh, I’m glad you brought this up! I forget about it as I haven’t found a good source, therefore I don’t use lard. But yes, I believe lard can be a great option. 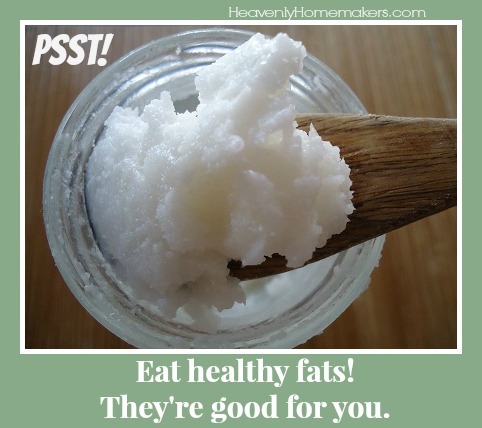 Lard is a “new” healthy fat in our home. I just recently got pork fat from a local butcher, and rendered it myself. . . not a hard thing to do. I read in a recent copy of Hobby Farm that it is a natural source of Vitamin D!! Lard is perfectly healthy if it comes from a pastured/humanely raised animal. Unfortunately, the regular grocery store variety comes from CAFO meat. If you could make it yourself or find some from a reliable source, I’d say great! I use lard all the time. I render it myself from the pigs that we get from local farms. When I make pie crusts, I use 1/2 butter and 1/2 lard in the recipe. Turns out great. Don’t ever use the lard from the grocery stores though. It is rancid stuff. We eat a lot of butter, coconut oil, and lard and we don’t get overweight from it. True! Think about our grandparents, not many had food allergies (if any) or a host of other “new” health issues. I believe a lot of the reason is because back then people at more whole local foods and real full fats. They ate homemade butter, whole milk and even fried foods in lard! AND most people from that era didn’t have digestive/food related issues! Science is killing our food. I have noticed with real fats that I’m not hungry after I eat-I’m actually full and not looking around for something low-calorie to munch on right after I’m done eating! Here Here!!! My inlaws ALWAYS give me a hard time because I use whole milk, real eggs, butter instead of margarine! I told them that margarine is gray until they add the yellow coloring! But hey, when they want to lose weight, they go on medafast. Why that you ask? Because all those little packets of instant breakfast and lunch shakes are “fortified”! yuck. Healthy fats is an area we are doing great on! My husband has lost 20lbs. by just doing this and no other changes. I however have not lost a thing. We are also off processed foods for the most part except an ocassional can of enchilada sauce and TJ’s tortilla chips-so I guess there was another change which I am sure helped as well. We however are struggling with coming up with enough money for grass fed meat or organic produce. The good butter like Kerrygold and the organic butter does make a big difference in our budget however if we were to get regular butter at Aldi then no not a change,but I never used margarine anyway. I rarely fork it out for the Kerrygold, but WOW is it delicious!! I have made the changes to the fats I use. Olive oil, coconut oil and lots o butter! I think I have made up my mind to take the plunge into raw milk. I have a son who is lactose intolerant and is not growing like he should. And his teeth develop dark spots even though he brushes regularly. I think it’s the store bought milk. Heading to the dairy now. This post made me feel like I am doing something right! This is an easy one. I use butter and coconut oil most often. I purchased Palm Shortening and made your Whole Wheat Quick Mix. I even tried my favorite chocolate chip cookies recipe using Palm Shortening instead of Crisco — SUCCESS! The only thing I need to do is find a good olive oil. I will double check your shopping link above and put that on my healthy habits priority list. Essentially you adopt an Olive tree, help an Italian family care for it and you also get Olive Oil. And hey they are currently having a sale. I have never used this brand nor have I purchased from them, but still passing along the link. Just curious as to why you did not include nuts as a good source of fat? Ha! Just forgot. :) Nuts are great! how do you incorporate coconut oil into muffins when it’s solid? You don’t…you need to melt it first, Jodi. I scoop out the solid coconut oil (do a best guess measurement), and heat it on the stove to melt it. I get this started while I’m mixing up my dry ingredients. Then, when the coconut oil is liquid, I pour it in like I would have a vegetable oil. Easy and wonderful! Mmm…I love all those things! Except I’ve never tried palm oil. As far as fats go, I mainly use butter, olive oil, and coconut oil. I love coconut oil. Sadly, it’s the most expensive, so I don’t bake with it much. But last week I found a 28 oz. jar for only $11.99 at my grocery store, which I think is good for oil that reads “extra virgin, organic, non-gmo”. The brand is better body foods. I’d never seen it before, but it is probably the best tasting I’ve tried! I love to just eat it when it’s solid…a spoonful, not bowl full, ehem. I know a lot of people prefer flavorless, but I really like it when it’s coconutty. Anyone know anything about sunflower oil? I always figured it was down there with corn oil or canola oil, but recently I tried some for cleansing my face(which didn’t work). But the kind I bought reads “virgin, first cold pressed, unrefined”. It’s a dark yellowy color and tastes and smells just like sunflower seeds…very strong. Sunflower seeds are good, so is the unrefined oil good??? Sunflower is oil is better, but not the best. I don’t use it to cook with, but if I find a potato chip or something that is made with safflower or sunflower oil, I don’t worry too much about it since it is occasional and since it is better than other vegetable oils. My favorite healthy fats are butter and coconut oil. This past year I used both. A LOT of both. I didn’t gain one pound when I switched to healthy fats. After finding your site a few years ago my eyes were opened to a whole new way of thinking about what is healthy. I gave up margarine and Crisco for butter. I also started using coconut oil and traded vegetable oil for olive oil. I can’t say I’ve lost weight, in fact, I’ve gained weight which is because of eating more since food tastes so much better now! I have to work on portion control, but I know these fats are much healthier than what I used to use. You make such a great point! I remember overeating the fat free stuff too, in hopes of finding flavor somewhere. Or, simply because I thought it was good for me so it didn’t matter if I overate. So thankful to know better now and to enjoy my food so much! Is 100% Extra Virgin Olive Oil good for you? Yep! Extra virgin olive oil is a great quality olive oil. Hi Laura, I love all your recipes & use them often. 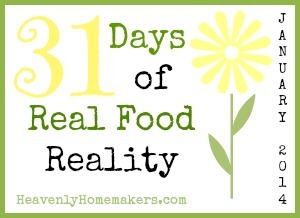 My family made the switch to real foods about 4 years ago & it has been great! However, I never fully made the switch over to whole fat dairy. Last summer my 8 year old daughter was found to have high cholesterol. My doctor almost accused me of letting her eat fast food & junk food. I told her that was not the case at all! I was totally shocked! We even had it checked a 2nd time – still high! Now I am really worried & confused about giving her things with eggs, butter & full fat dairy. Do you have any thoughts on this? Thanks so much for your time! You just can’t beat butter! :) And I’ve been using coconut oil for nine months or so and love it too. Hi Laura, I will keep the little one and his family in my prayers. He is blessed to live with you and your wonderful family. I know he will pick up Christian values that will go with him through out his life.